I think it is pretty amazing that Robert Pierre is just a young guy starting out...he has some great songs. I find that I am tapping my toes, or humming along to the songs. They are really catchy and the words are all so encouraging! 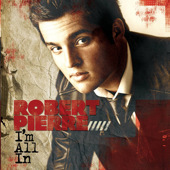 For Robert, I’m All In is more than the name of his third studio album, due July 26 from thinkaboutit records. It has become Robert’s life motto as he responds to God’s calling to live fully committed to Him. In addition to writing and recording I’m All In and playing on a summer tour, Robert also leads regular Sunday morning worship at his 800-member Orlando, FL church. And he’s done it all as a high school senior. Creating I’m All In was a powerfully personal experience for Robert, who teamed with veteran songwriter Jason Ingram (Tenth Avenue North, Sanctus Real, Bebo Norman) and legendary producer Matt Bronleewe (Jars of Clay, Michael W. Smith, Steven Curtis Chapman) on the album. The result is a collection of songs that enthusiastically and energetically worship God while wrestling with what it means to be a Christian in a world full of difficulty and joy, anxiety and excitement. I would share this CD with my sister. If given the chance to win I'd give to my friend.